3 Metre Aluminium Pipe Tube Carrier with a Plastic PVC Liner. Crash tested to capacity to 20g. Universal 3m high quality pipe carrier tube made from silver coloured anodised aluminium. Able to carry up to 36 x 15mm x 3000mm copper pipes weighing up to 50kg. External dimensions 118.5mm wide x 90mm high x 3030mm long. Opens at both ends with integrated locks (supplied with 2 keys). 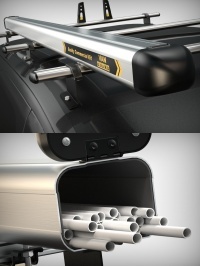 Designed to fit any van roof bar or van roof rack with bars that are 20-50mm high and 20-60mm wide.